How to recover deleted PowerPoint files? Suppose you are preparing a presentation all for an important meeting at your office. On the very day of the meeting, you see that the presentation is missing on your laptop. You vigorously search for it on your system only to find that all your hard work is gone. Think for a second - what if this happens to you. It will annoy you, frustrate you, and you cannot do anything about it. So, to save yourself from such nightmares and keep yourself on the safer side, learn about the possible causes and feasible solutions. We have listed a few scenarios that many users of MS PowerPoint have reported on different forums. These users faced PowerPoint file deletion before they could present it in front of the audience. “I was building a presentation in PowerPoint with many images. But, it was closed all of a sudden before I could save. How can I recover it?" Search for the file in the Temp folder on your computer, the moment you realize that your PowerPoint file is missing. Look for files that match the size of your PPT. It is quite possible to recover your file from them. Click Start and select Search. Type in the name of the file you are able to recall, add the extension name.tmp, and hit Enter to search. A window will pop up after the search. Open the files that you think are of the same size as of your lost PPT. Find your file in the list; open and save it safely to another location of your choice. If the above-recommended methods do not work, then you must opt for an intelligent third-party tool. There is a plethora of tools available in the online marketplace. So, it is confusing and difficult to choose once. So find an easy and comfortable data recovery tool. 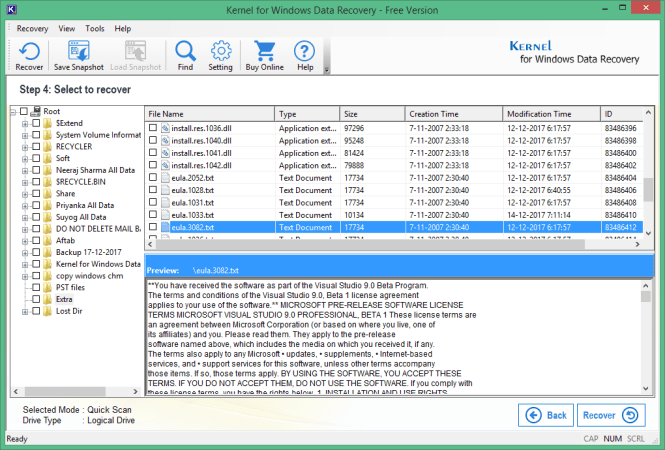 And the best one is Kernel for Windows Data Recovery Free Version as many IT Professionals recommend it. It can recover all deleted and lost files/folders, media files, emails, and much more. With the free version, you can recover 2 GB of data efficiently. 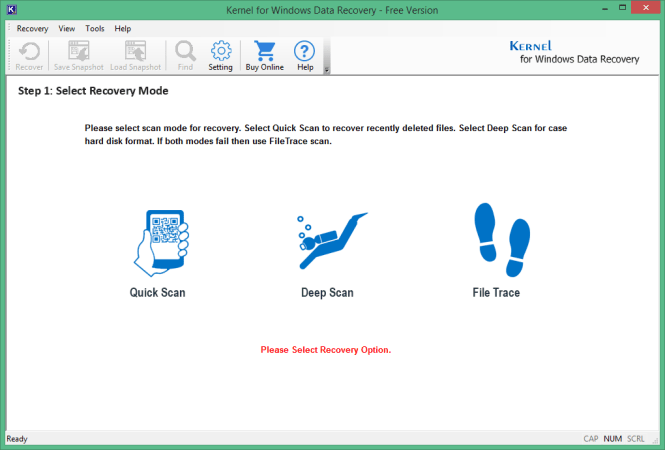 Download and install the Kernel for Windows Data Recovery Free and launch it on your system. Now select scanning options according to your requirement. The software offers three scanning modes. The first one is the Quick Scan mode which recovers corrupt files quickly and easily. The second one is the Deep Scan mode which is used in cases where quick scan mode fails to perform. And, lastly, File Trace mode can be used for highly corrupted files and in cases where deep scan mode fails. In the next step, when you have selected the drive for scanning, you can Preview all the recovered PPT files before restoring them on to your machine. At the end, click the Recover button and get back your lost Windows files safely. 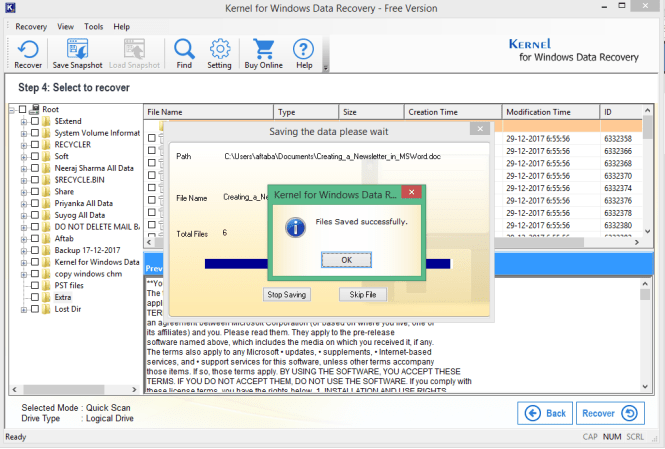 The Kernel for Windows Data Recovery Free Version helps you recover lost and deleted Windows files such as PPT and many more. This free data recovery software comes with a very user-friendly graphical interface and it is the best solution for non-technical users. How to recover deleted MS Word documents? How to recover deleted Excel files? How to recover inaccessible Text files?